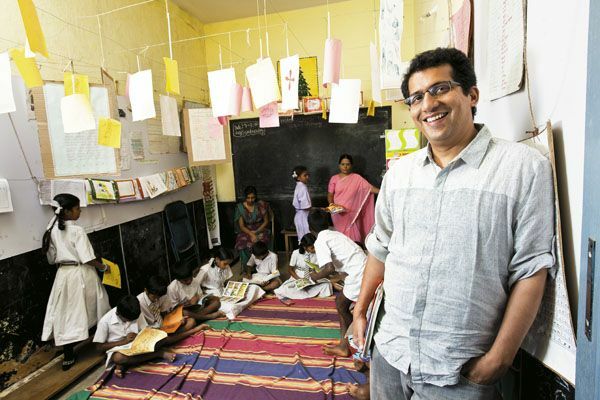 Umesh Malhotra (BTech, MM/1990) is the founder of Hippocampus which is a network of libraries and schools that is attempting to change the face of rural education in India. He is a serial entrepreneur with dabbling in IT services, Restaurants, Education Retail, and Social Entrepreneurship.He is a Ashoka and Asia Society fellow and is a graduate of IIT Madras. Umesh Malhotra visited the institute this Friday to give a talk on entrepreneurship. We got the opportunity to talk to him afterwards and he shed some light on his journey thus far. He tells us that he wanted to be an entrepreneur even before he knew what the word meant and that serendipity has played a major role in shaping his career. He tells us that he wanted to be an entrepreneur even before he knew what the word meant and that serendipity has played a major role in shaping his career. The first ‘accident’ as he fondly calls it was getting into IIT Madras. He first tested the waters of entrepreneurship the summer after his freshman year,selling washing machines to car mechanics.He then went on to become the coordinator of Quark because those days in IITM it was the only entrepreneurial thing students could do. He said the best part about the Quark business was that if you lost money the institute covered it and so he could take risks without any fear. He expressed that he enjoyed the experience so much that he continued managing Quark even after his term as coordinator ended. After graduating,he took up a job as a business manager in Infosys which at that time was a small startup with less than a hundred employees. He stated that even though he enjoyed the work there the entrepreneur inside him made him contemplate where his life was headed and he almost quit five times during his stint there. He later moved to California on an expansion project and got exposed to the startup buzz in Silicon Valley during the dotcom bubble. When he was 30 and running about five percent of the company, he had a discussion with some of his friends who were deciding to start a venture and he resolved that this would be the perfect time for him to startup. He moved back to India and founded a company called Bangalore Labs in the IT infrastructure management space. …..he feels students should not start up right after college and that he feels the correct time is after a 5-6 year corporate stint because good companies teach you the value of customer service, human resource management and also other professional skills and ethics which are useful for startups. We asked him how useful his stint at Infosys and whether he felt he should startup earlier. He says that it was a time of entrepreneurial growth at Infosys and they provided him most of the challenges he sought. He also tells us that he feels students should not start up right after college and that he feels the correct time is after a 5-6 year corporate stint because good companies teach you the value of customer service, human resource management and also other professional skills and ethics which are useful for startups. When we asked him why he chose this particular space he said that the software services space was too crowded and there was no room for another player and so infrastructure management seemed like the right choice.They managed networks and security and built India’s first network connection centre. He tells us that their office had these flashy screens which looks like something out of a lab from NASA and that they could do all of this for companies across the globe while just sitting in India. Eventually he sold the company to Planet-One Asia. Amidst all of this he realised that there was a severe dearth in the number of good children’s libraries and so a short while after Bangalore Labs he decided that he wants to address this issue and set up Hippocampus which started as a library for children. He goes on to say that when he interacted with the children there he got to see real joy and happiness on their faces, which is something he could never experience in the IT Sector because of limited interaction with consumers, so it was something totally new for him. Hippocampus then expanded into a library program which teaches existing libraries methods to improve their readers’ reading habits. Hippocampus currently has a goal called ‘Mission Finland’ where they plan to educate as many children as the total population of Finland, at one tenth of the cost. One day when Rohini Nilekani visited the library, she told him about the work she did with the Akshara foundation to aid government schools and he decided to accompany her on her next visit. He told us he was appalled by the apathy with which these schools were run. He decided to do something about it and started Hippocampus Learning Centres, which operates pre-schools in rural areas. It started in 2011 with seventeen centres and has grown rapidly to more than three hundred today. Hippocampus currently has a goal called ‘Mission Finland’ where they plan to educate as many children as the total population of Finland, at one tenth of the cost. The model followed by Hippocampus to maintain the high levels of consistency they strive for is that they go to a village with a population of about five thousand people, rent a space and then they go and recruit teachers from the same community through a rigorous five step selection process. After this the teachers are trained and they prepare a step by step detailed curriculum outlining what they have to do and how to do it in thirty minute intervals.Each centre has about 3 rooms, 3 teachers and 60 children.He expresses that one of the most difficult challenges faced by Hippocampus is changing the mindset of the people in the village towards education. He narrates an anecdote of a woman in a village he met, who wanted to change the way schools teach in her village, and went to a school to explain some solutions she had but was admonished when she approached the headmaster because she was a woman from a backward caste. He believes that the only way forward is to get rid of this mindset that is entrenched in our society. Hippocampus wants to create an atmosphere that moves away from the rote learning system and adopt the unconventional style similar to pre-schools like Eurokids, and it was very difficult for them to convince the villagers because they were used to that system. He tells us that the method they adopt is to ask the villagers to give them some time and see the effect,after they see a tangible change in the children’s knowledge and personality they are convinced of Hippocampus’ teaching style. [Umesh says that] no matter what the venture is, it should be able to solve an important problem faced by society today and that there should be a well thought out plan in place to do so. We asked him about the way forward for people who are interested in social entrepreneurship but also want to make money. He tells us that Social Entrepreneurship has transformed a lot from just being the NGO space and can pay well, many social ventures are funded by venture capitalists and even many employees earn handsomely.We then asked him about the literacy scene in India and about some avenues for social startups. He explained that we have made significant leaps in literacy in the past few years, especially in Karnataka and Maharashtra where now close to half the women have passed 10th grade.He said there is a two-fold problem, one being that there are no jobs in villages for educated people which drives people away from it and also those who are educated and move to big towns for employment face a lot of challenges getting a job because of low supply. He also said India has one of the lowest numbers of women in the labor force. He goes on to say that a good avenue for a social venture is to look to create jobs for educated people and that this will solve a lot of other problems in other areas as well because it can expand the market size and make the economy grow. He told us that no matter what the venture is, it should be able to solve an important problem faced by society today and that there should be a well thought out plan in place to do so.